1. Each successful participant must complete ten (10) events in order to receive the incentive patch. The patch is available to both BHVA members and nonmembers. 2. Only those events listed in the 2019 BHVA Event Book will qualify towards the required 10 events. Fleese Jacket [red or navy blue with the logo on it]). This incentive is available to only BHVA members. This incentive is to encourage our members to support our year-round and seasonal events as well as our traditional events. 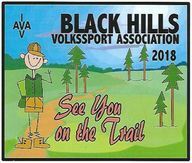 As in past years you must complete the event card found in the back of the 2019 Black Hills Volkssport Association Events book or you can pick up a separate score card at any BHVA event. Fill out the card as you complete each event. Remember to write the name of the event (as it appears in the event book, website, or trifold) on the card rather than stamping it with the event stamp to simplify Diane's bookkeeping. If you are a visual learner (most of us are) we have included an example of the two completed 2015 incentive cards. Additionally you can download an Incentive card (see below) as well. Upon completion of 10 events (walks or bikes) by Dec.31, 2019 mail your card to Diane Johannesen, Box 16, Sundance, WY 82729 no later than Jan. 10, 2020 and a FREE patch commemorating your accomplishment will be mailed to you. Please send one Forever stamp to cover mailing. Do NOT send any envelopes, only the postage stamp and a mailing label if you have one. All individuals completing the V.I.P. 2019 program will be listed on the club web page. Once you have completed the ten additional (all different events) send your completed card and incentive order form for vest or jacket to Diane at the address listed above. If you have questions regarding the BHVA Volkssport Incentive Program. 2019 qualifications please contact Diane at 307-290-0746 or by e-mail at dianejohannesen@hotmail.com. This year you have a choice of a vest or fleece jacket. See form below.